What is Armed to Farm? Learn more about current opportunities, technical assistance, and online tutorials. Note: NCAT’s Armed to Farm information is also available in PDF format for easy printing and sharing. Thank you! The National Center for Appropriate Technology (NCAT) hopes to give military veterans and their spouses an opportunity to see sustainable, profitable small-scale farming enterprises and examine farming as a viable career. Trainings range in length from conference presentations, two-day workshops, and week-long training events. Keep scrolling to learn more. Consider subscribing to our newsletter to be notified. Thank you. NCAT Sustainable Agriculture specialists will teach the training sessions. Additional contributors will include staff from Sterling College and USDA agencies, plus experienced crop and livestock producers. Applications are available at: www.ncat.org/atf_VT and are due by Monday, May 3rd, 2019. All military veterans, as well as their spouses or farm partners, are welcome to apply. However, selection priority will be given to residents of the Northeast region. The number of participants will be limited. NCAT will notify selected participants by May 10th. …and are due by May 3rd, 2019. Armed to Farm will take place June 10-14, in the Craftsbury Common, Vermont area. Participants will attend classroom sessions at Sterling College, a private college in Craftsbury Common. Several local farms will provide hands-on learning experiences. The event is free for those chosen to attend; lodging at Sterling College, transportation to local farms, and most meals will be provided. Participants must pay their own travel costs to and from the event. Armed to Farm is sponsored by NCAT’s ATTRA Sustainable Agriculture program and the USDA’s National Institute of Food and Agriculture. Margo Hale at margoh@ncat.org or (479) 442-9824. 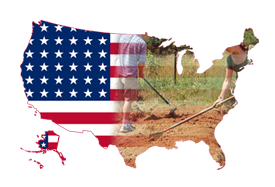 • September 10 – 14, 2018 ~ Washington, D.C.
Funding for Armed to Farm has come from NCAT’s ATTRA – Sustainable Agriculture program, USDA Rural Business Cooperative Services, USDA Beginning Farmer and Rancher Development Program, projects with the University of Arkansas and Cornell University, USDA Risk Management Agency and Swords to Plowshares.